Millions of tons of fish are caught and released in commercial and recreational fisheries around the world every year. To properly manage and maintain the health of fished populations, we need to understand the rate at which released fish die and the factors that influence mortality. Many fish that are targeted or taken as bycatch during commercial and recreational fishing activities are discarded due to either regulatory measures—minimum landing sizes, possession limits, and catch quotas—or personal conservation ethics. Some of these fish are discarded dead, while others are released alive. However, in the hours, days, or even weeks following release, some portion of the live discards may die due to the stress and injury incurred during the catch and release event. This is what’s known as discard mortality. The ability of a species to survive catch and release is highly variable and depends not only on the species, but also on the fishery, type of fishing gear, and multiple environmental factors that require detailed research to uncover. We partner directly with fishermen to observe and evaluate fish that are caught and discarded under authentic fishery conditions. 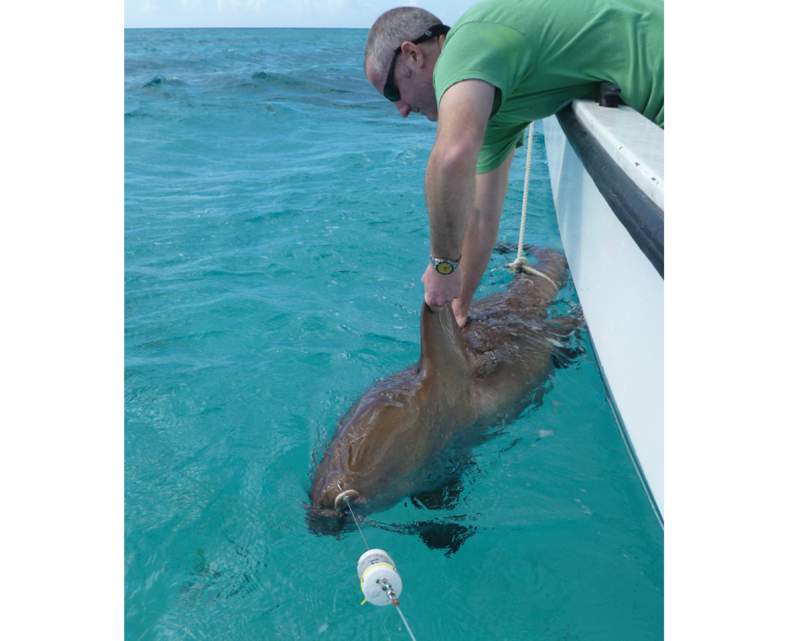 We may collect blood samples, evaluate reflex responses, or note physical injury to quantify the negative impacts of capture and handling. Using advanced tagging technology, our scientists can even track the movement and behavior of these fish in the days and months following their release to determine whether they survive. Our studies are designed to not only answer the question “How many fish die?” but also “Why do they die?” and “How can we improve their chances of survival?” Data generated by our studies directly inform and influence fishery management plans, fishing regulations, and stock assessment models. Our results also translate into “best-practice” guidelines that educate fishers on ways to minimize injury, stress, and mortality of the species that they frequently catch and release. To learn how Anderson Cabot Center scientists are using cutting-edge technology to investigate critical fisheries issues, visit our Fisheries Science and Emerging Technologies Program (FSET). Recreational fishing is a popular activity that bestows significant social and economic benefits on coastal communities. In many recreational fisheries, a substantial portion of the total catch is discarded due to regulatory measures (such as minimum landing sizes or possession limits) or personal conservation ethics. In order to understand how catch and release impacts fished populations, it’s imperative that we obtain an accurate estimate of the mortality rate of those discarded fish. The goal of our work is to estimate this rate for important recreational species, and identify the specific aspects of the capture and handling process that influence mortality. Data generated by our studies not only directly inform and influence fishery management plans, fishing regulations, and stock assessment models, but also translate into “best-practice” guidelines that educate recreational anglers on ways to minimize injury, stress, and mortality of the species that they frequently catch and release. Our current species of focus include Atlantic cod, haddock, cusk, black sea bass, and yellowfin tuna. The thorny skate (Amblyraja radiata) population in the Gulf of Maine is at historic lows despite a possession ban on the species since 2003. At present, we do not know the degree to which their continued decline is due to ongoing incidental fishing mortality. To answer this question, we are working with local commercial fishermen and using pop-up satellite archival tags to estimate the discard mortality rate of thorny skates that are caught as bycatch in the northeast commercial trawl fishery. We are also mining existing data to identify bycatch hotspots, which are locations and times where the likelihood of thorny skate bycatch is high within the Gulf of Maine. Results from each component will be integrated to develop practical bycatch avoidance strategies for thorny skates (e.g., geographic areas that should be avoided in space and time), to provide commercial fishers with clear recommendations on best-practice fishing and handling methods for reducing post-release mortality in trawl-caught thorny skates, and provide fishery managers with a robust estimate of thorny skate discard mortality rate.